To me, fall is the perfect season. 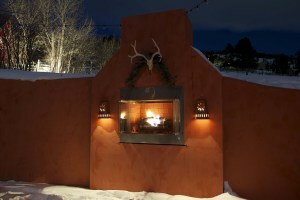 The colors are beautiful and the cool temperatures call for nights cozying around a fire. 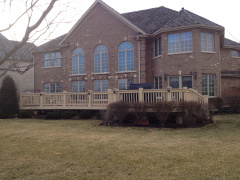 When our deck builder in Rolling Meadows, IL and the surrounding areas shared this project with me that he completed this last summer, I couldn’t help but imagine spending my fall nights on it. 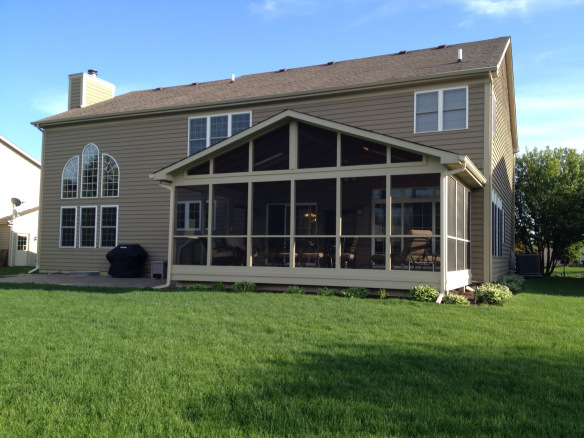 The owners of this home in Mokena, IL wanted to update their backyard with areas for shade, sun and plenty of warmth. 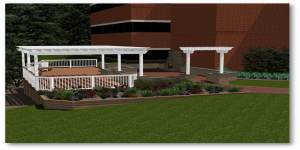 The Archadeck of Chicagoland team designed a combination screened porch and patio with two fire features that will allow for plenty of use. Attached to the back of their home, the owners wanted a roof structure that had room for both a living area and a dining area. The Archadeck team not only gave them what they asked for, but took it to the next level. The large screened porch easily fits a large couch/sectional and dining table for 6, but doesn’t feel at all cramped due to the square footage and the cathedral ceilings. Higher ceilings make spaces feel larger. At one end of the room, a large, and gorgeous fireplace was installed to make it feel cozy and to increase use. While this room is technically a screened porch, the Archadeck team installed 4-track windows to make it a porch and sunroom in one. Tracks slide up and down as needed. The tracks may be open all spring and summer, but be moved up in the fall and winter as the nights get cooler. Personally, I love the finishes of this porch. The pressure treated pine-decking complements the brick of the home and gives it that rustic feeling that is so beautiful. 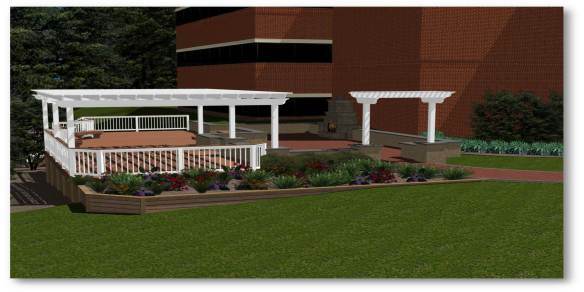 But let’s not forget about the patio design! 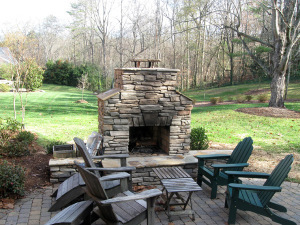 Right off the screened porch and next to the home are square pavers and then freeform stones were used around the custom fire pit. The two types of pavers work beautifully with the home’s subtle brick and provide transitions from space to space. 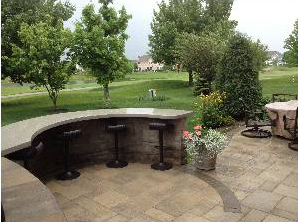 Instead of a square or rectangular patio, Archadeck designed a curved patio for visual interest and flow. The homeowners are thrilled with their new outdoor living space. To me, it’s a great example of how design can make all the difference. 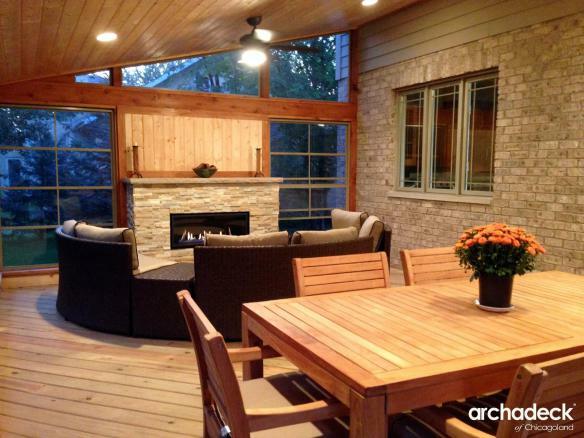 The combination of screened porch with track windows and outdoor fireplace with a patio with a custom fire pit is the perfect space for the Illinois area. It truly maximizes the amount of time the owners can enjoy it! 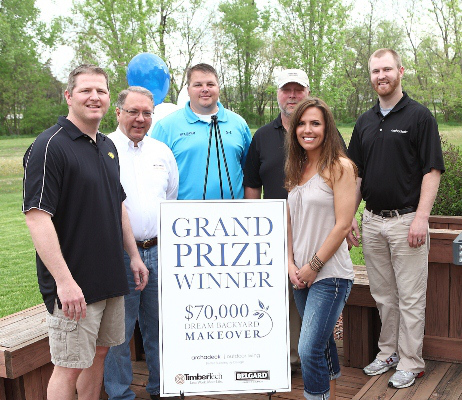 If you’re interested in updating your backyard, please reach out to your local Archadeck Outdoor Living office. This is an all too familiar sight: a backyard with a small concrete slab off the back of the home as the only true outdoor living space. As you can see with the fire pit, Adirondack chairs and outdoor dining table, these homeowners enjoy spending time outdoors. While there isn’t a lot of backyard space to work with, they needed to update what they had. 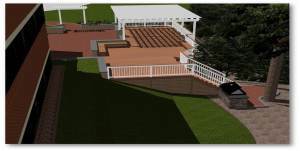 Archadeck of Charlotte created the perfect patio design for the size. The clients on this project knew there wasn’t a ton of space to work with, but they felt like their existing outdoor living areas were disjointed, primarily because some of it was on the grass. They were willing to lose a lot of the grass space as long as the new outdoor living structure felt open and addressed their current design dilemmas. The patio designers at Archadeck laid out this curved paver patio that gives them all they wanted without losing their entire yard. The owners were clear in their desires: space to eat outdoors as well as a built-in fire pit around which to sit. When planning the space it was clear that a standard square or rectangular patio wouldn’t work. Significant space was needed to fulfill the owners’ outdoor needs, but squaring it off would take up too much space leaving them with no lawn. It also may have resulted in less flow to the patio. By curving the edges of the patio, it gives a it a clear direction, not to mention it gives it a little more style and makes it feel more open. 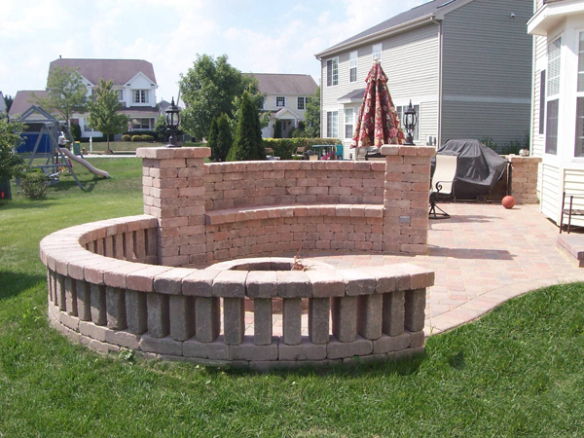 By moving the fire pit closer to the home and making it a permanent feature, it not only gets more use but also becomes a focal point in the backyard. 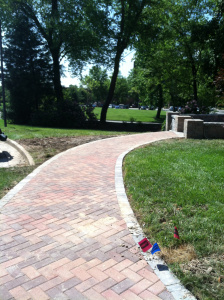 The feature was finished in the same paver color and design as the patio. A wide edge around the pit was created to give it more weight and provide additional seating when the fire isn’t lit. Patio designs should be created with the homeowner in mind as each one is different and will use the space in their own way. 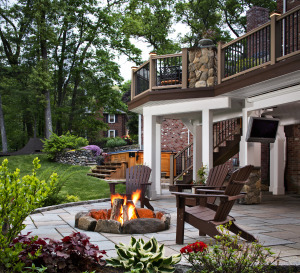 At Archadeck Outdoor Living, we pride ourselves on getting an idea of what our clients’ dream backyard would entail and create a space around it. 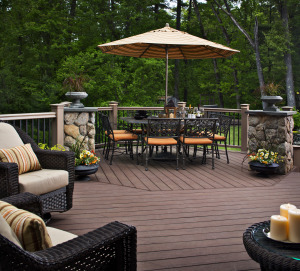 If you’d like to discuss improving your outdoor living space, please contact your local Archadeck Outdoor Living office. When it comes to outdoor living spaces and structures, there are aspects that you may be able to do yourself, and others that are just too complicated. 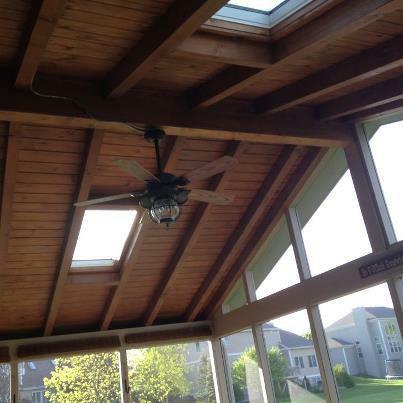 When it comes to the structures themselves, we say leave it to the professionals. This article from the New York Times illustrates how hard it can truly be to build a patio yourself. “… Get a multitude of muscle, spread out over at least two bodybuilder friends who owe you a huge favor. Ideally, one of those friends will own a truck and the other will own a skid-steer machine, like a Bobcat. If not, you should consider renting one of those, or finding more friends to help carry the load.” Source. A beautiful paver patio can be a great place to sit back, relax and enjoy time with friends and family, but a lot of work goes into creating that space. First off the area for the patio needs to be dug out and leveled. This involves digging up any grass that is currently in the place and creating an even space to start with. 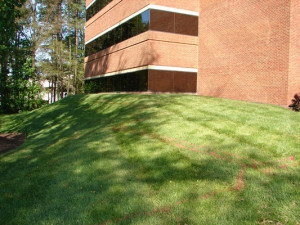 This can be a tedious task on properties that have any type of slant or slope, but it is incredible important. 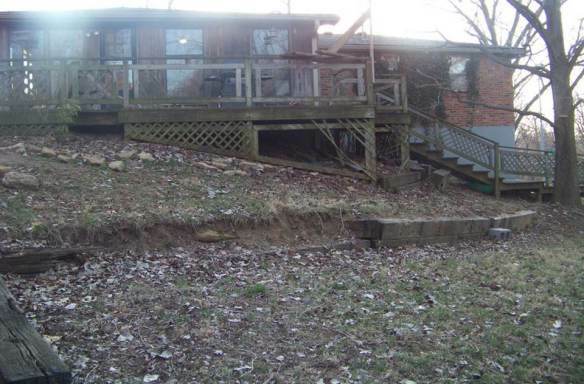 If you don’t start with level ground, your patio won’t be level either. After preparing the ground, base layers of gravel and sand are placed on top. Each layer has to be level too. The base keeps the pavers from moving around and allows water to flow through the base without pooling on your patio’s surface. 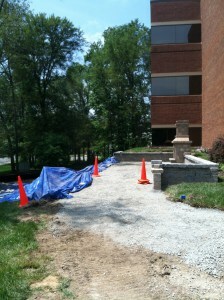 When all of that is done, pavers can now be placed and secured, creating a lovely patio. Concrete or polymeric sand are just two of the options to lock everything in position. If you are considering adding a patio to your property, save yourself the time and hassle and hire a professional patio designer and builder. Not only will they do all the dirty work, but they will also work with you to design and create a space you’ll love for years to come. Summer. It can bring both beautiful weather and harsh thunderstorms and rains. 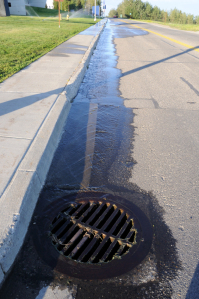 Have you ever been outside after a long or hard rain and noticed the water along the sides of the streets going to the drain? Or worse yet, have you driven through puddles and splash water everywhere? That water carries harsh pollutants like oil and grease into our drainage systems. A newer paving system gaining traction in the U.S. cuts down on that storm water: permeable pavements and pavers. Permeable pavements and pavers don’t push the water to the side like traditional asphalt or concrete pavement. 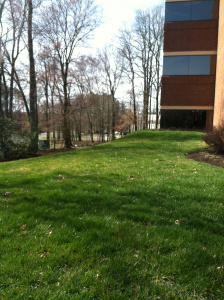 Instead, they allow storm water to go through the pavements and into the ground below. It’s growing in popularity in the U.S. after being widely used in Europe due to its low-impact benefits. Miles Chaffee, President and founder of Milestone imports explains: “it decreases impervious land coverage, provides a more stable load-bearing surface, and allows the water to go into the ground. It eliminates the need for detention ponds, which require additional space. And it takes off a lot of stress from the sewer systems when it’s done correctly.” Source. Permeable pavers and pavements are not for high-speed traffic areas, but are great for driveways, walkways, patios, alleys and parking lots. 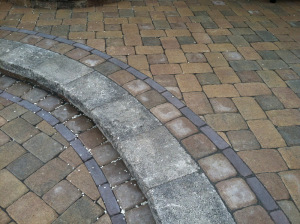 The pavers sit on top of several inches of different types of base (sands and stones) that allow the water to pass through easily, eliminating any puddles on the surface of the structure. Permeable paving not only controls pollutants and manages runoff, but it also can help bring more color to a city or town. By allowing the water to seep into the ground, it gives trees around the area more water to mature their root system and grow effectively. While cities like San Francisco, Chicago, Portland and Richmond are using permeable pavements to handle their storm rain issues, it isn’t only for municipalities. 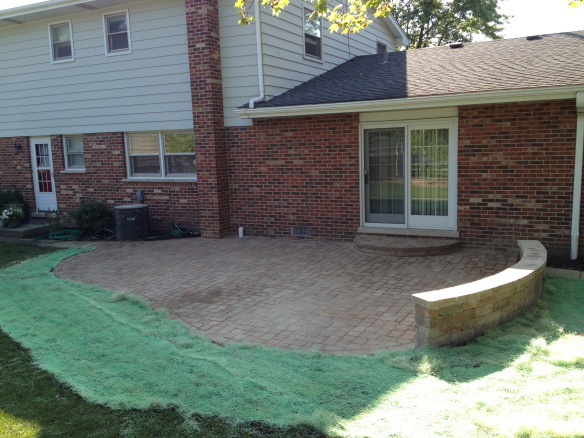 Permeable pavers are wonderful for residential properties as well. 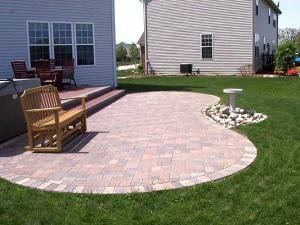 At Archadeck Outdoor Living, we’ve designed and installed permeable paver patios, driveways and walkways. Not only are they more aesthetically pleasing than normal asphalt, but it can aid in landscaping and minimize standing water where mosquitoes can breed. If you have questions on permeable paving and its benefits to your property, please contact your local Archadeck Outdoor Living office. 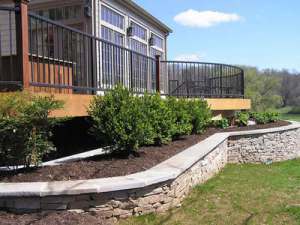 Working at Archadeck Outdoor Living, I’ve seen some beautiful patios, walkways, outdoor kitchens, outdoor fireplaces and other hardscaped areas over the years that our offices have designed and built. The beauty of the finished product can be misleading however. 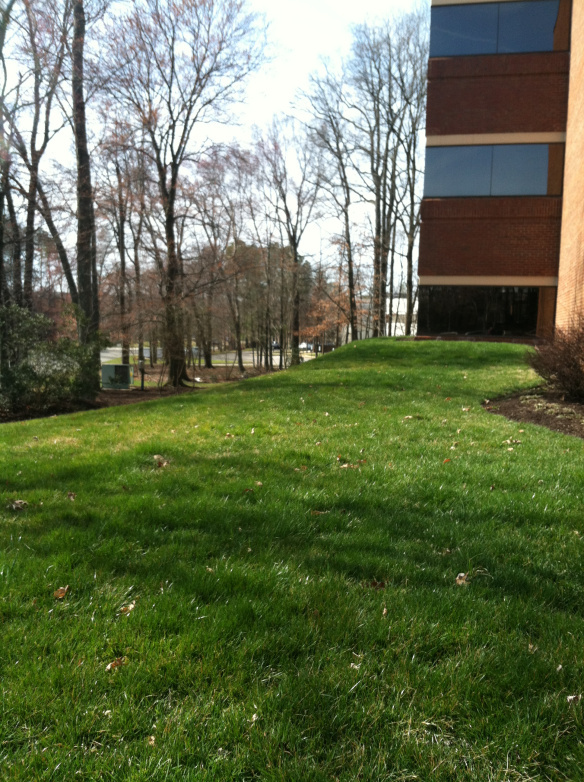 At its surface, the patio looks gorgeous, but what lies below is what keeps it looking that way in the long run. 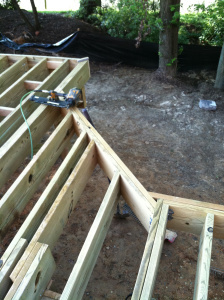 Building a patio that will hold its shape and structure is more difficult than the looks of it show. The first step is to prepare the ground for the patio. 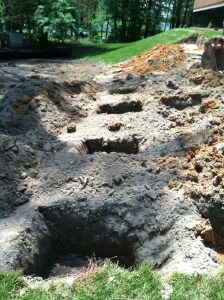 This includes grading and digging footings. Grading is the process of leveling the ground. 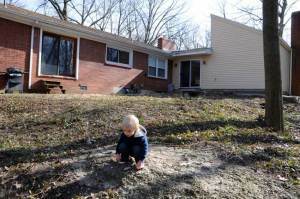 If the ground isn’t properly graded, it will lead to an uneven outdoor living space. Grading may include removing or adding more dirt to the space and packing it down until it is firm and even. 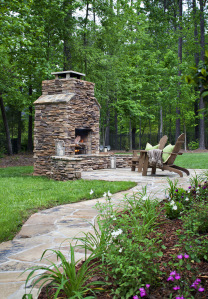 If the patio is a simple patio, footings may not be required while preparing for the build, but if you are adding something with extra weight, like an outdoor kitchen or outdoor fireplace, footings need to be created. 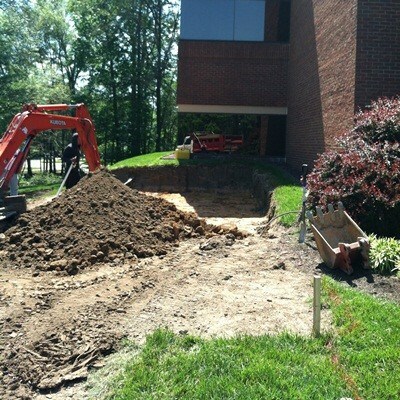 Footings are essentially bases for extra large structures. 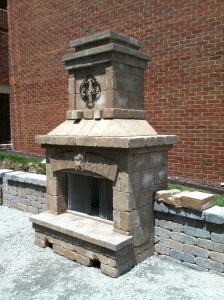 For this example, let’s use an outdoor fireplace. Due to its weight, it needs more support from below. A large hole is dug underneath where the fireplace will ultimately sit. That hole is filled with concrete that, when hard, will be able to hold up the outdoor fireplace for years to come. After the footings are dug and the ground is leveled, the layers begin. The first layer that is placed on the ground is called base stone. 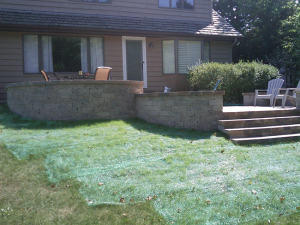 Base stone is key to keeping the patio level over time and seasonal changes. Once the stone is laid in place, it is then impacted down. Like the dirt below it, the base stone will be leveled. After the base is all set and in place, sand is spread and leveled on top of it. Sand is a helpful as the pavers are placed down on top of it as it helps to keep it all in place before everything is locked in tightly. 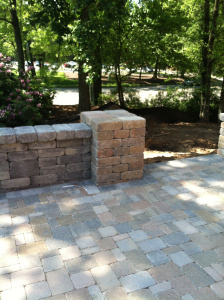 Laying pavers can be as simple or as complex as you’d like. It just depends on how intricate you want the design of it to be. At Archadeck, we’ve done some that are simple rows and others with circular or curved patterns. Once everything is in place, it has to be secured. 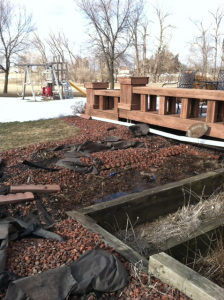 Along the sides of the patio, there will be an edging materials that digs into the ground. It works as a barrier for the pavers. 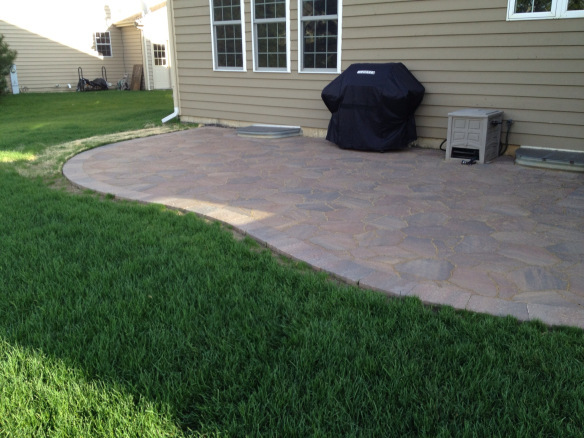 The most common way to lock your paver patio in place is to use polymeric sand. This sand is spread and swept on the surface of the patio, working it’s way into all the nooks and crannies of the entire space. Then it will be exposed to water. When it gets wet, the sand will harden, similar to concrete. As you can see, building a patio is much more difficult than simply picking out a stone that you like. At Archadeck, we take great pride in our work and take the time to do it all correctly so you can enjoy the space for years to come. If you have any questions on designing or building custom patios, please contact your local Archadeck office. Over the past month I’ve been spending a lot of time reading and looking at the Archadeck Dream Backyard Makeover submissions and themes have started to emerge. 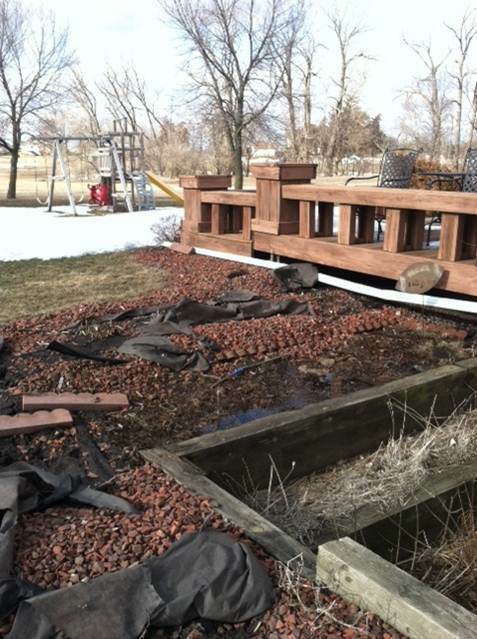 One that seems to be recurring is homeowners being left high and dry by their deck contractors. Several entries have shown (including one of our February finalists) decks that are half or barely finished. The descriptions reference a contractor that they found out wasn’t licensed and the building they did do wasn’t to code. It’s no wonder why so many homeowners are hesitant to invite contractors to do projects on their home. What’s your contractor license number? 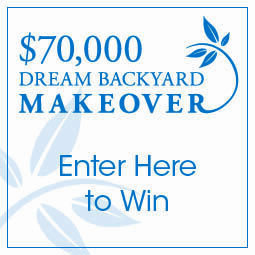 Many homeowners ask prospective contractors if they are licensed, but reading the contest entries has made me realize that sometimes people lie. You should be able to get the contractor license number from the people you are thinking of working with. That way, if something happens, you have it on file. How are you insured? A good contractor has the appropriate insurance to protect you against damage that is done to or on your property. If something happens, it shouldn’t have to go through your homeowner’s insurance. Will you pull the local building permits and have them on file? 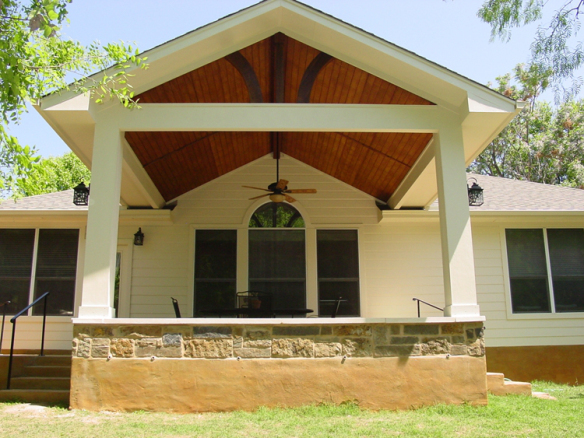 Any structures built on your property need to be built to the local code. Permits must be pulled and inspections must be made (sometimes a few times during the building phase). A contractor who is good at patio and deck construction will do this for you, but you should have access to permit numbers if needed. What warranties do you have? 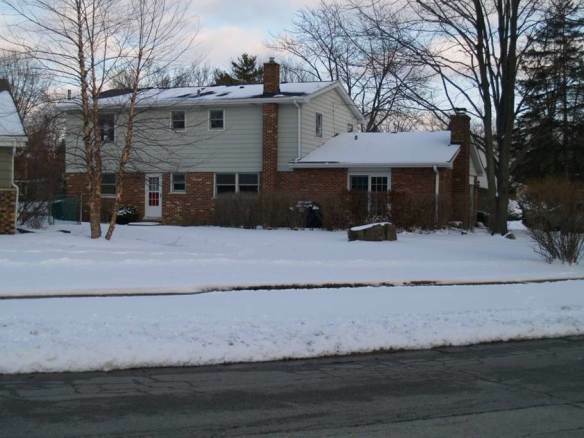 No one wants to invest is a large home improvement project just to have it break or fail. It’s even worse when there is nothing you can do about it. 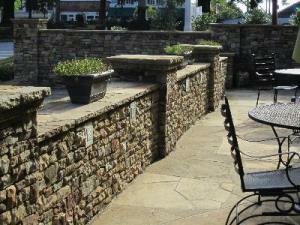 At Archadeck Outdoor Living, we pride ourselves one having 2 guarantees to protect our clients. Additionally, if you have an issue with the material, we will work with you to get in touch with the manufacturers to look at their warranties. Could I have some references? It’s understandable that homeowners are careful about who they invite into their home. 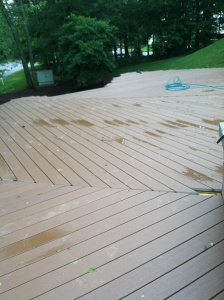 Every deck contractor should have a list of clients that you can reach out to and ask questions. 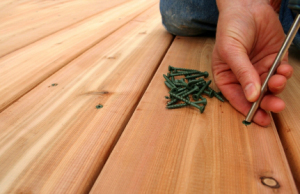 Asking these questions will help you to choose a deck construction provider that you know you can trust. If you have questions regarding our process, please contact your local Archadeck Outdoor Living office. 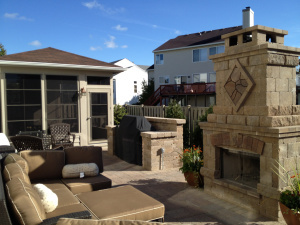 The common denominator to any great outdoor living space is a great design. A great design not only takes the clients wants, tastes and budget into account, but also the existing home and the property that it is being built on. 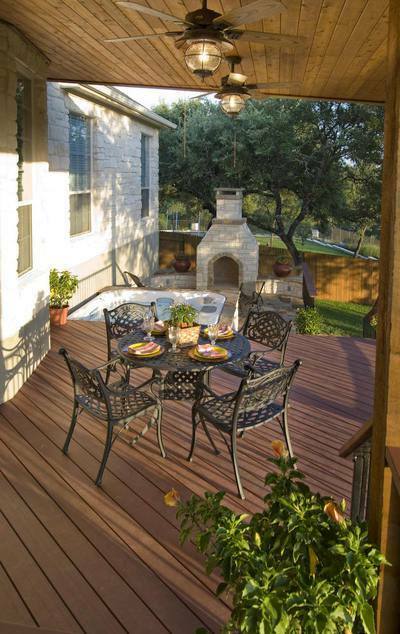 When it comes to great patio designs, the opportunities are endless. Shape. Too many homes have the standard 5ft by 5ft concrete slab off the back of their home. What a waste! So much more can be created and built. Many of our clients want a space that has straight lines that mirror the lines of the home, while others want something different. 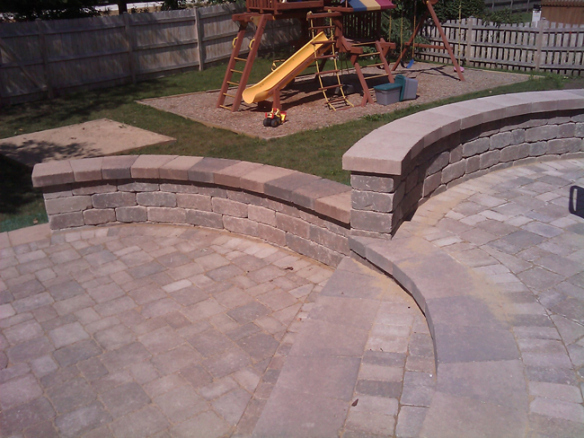 Curving the edges of the patio is a different style that is just as nice. 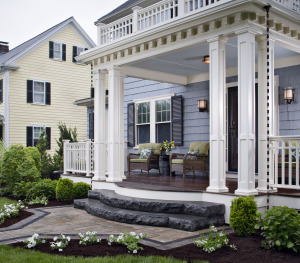 A softer line often creates a more fluid open feel to an outdoor space. Material. 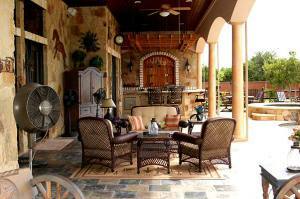 A good patio design takes the existing property into account and enhances it. What the patio is made of is a key component. There are so many different styles of patio products that we are positive there is something for you. If you like a classic look, a brick or rectangular stone may work beautifully in your space. If you prefer a more natural look, there are natural stones, or products that look like natural stone that may hold up better. 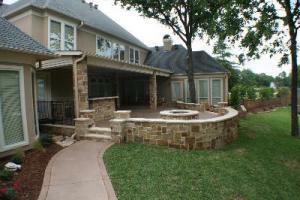 Stamped concrete is another popular product as it can be colored or stamped with numerous designs. Layout. If an outdoor living space is going to be utilized for numerous purposes, it is important the different areas are defined. While this can be achieved with outdoor furniture, it can also be done through design. Adding multiple layers is one way to do this. One area may be used for cooking and eating that has an outdoor kitchen and dining table and two steps down there may be a living room set up with couches and chairs. Another way to define spaces is done through the installation of materials. A different finish may be used or the same product may be used but placed in the opposite direction. 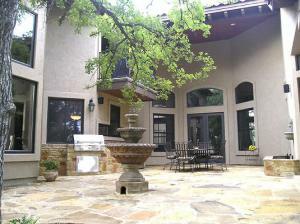 Lastly, a great patio design incorporates design features that are practical. 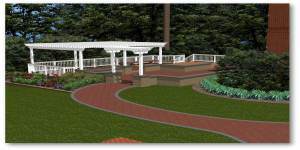 Design features can take numerous forms including retaining walls, planters, benches, outdoor kitchens, fireplaces and fire pits. It all depends on what the client wants. These finishing touches don’t always have to be part of the original build, but rather added later. 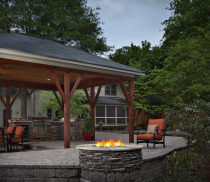 If you have questions about patio design, please contact your local Archadeck Outdoor Living office. One of the first questions our outdoor living designers ask our clients is “how do you intend to use the space?” Without that answer the design won’t be as good as it can be. Answers to that question can vary from cooking with and entertaining friends and family to sunbathing and relaxing. For many of our clients their outdoor living spaces need to multifunctional. If that’s the case, the designer needs to create a project that has a flow that defines the separate spaces for different functions. Many of our clients choose combination outdoor living spaces, meaning a deck with a pergola, patio with outdoor kitchen, etc. Using different structures is a clear way to define separate areas within an outdoor living area. 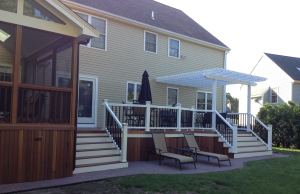 Here are some beautiful examples from our Archadeck Outdoor Living franchisees. This project from our patio and deck builder in Boston transformed this backyard into a multipurpose space using a patio, deck and sunroom. The sunroom is a beautiful extension of the home that looks as if it’s always been there. 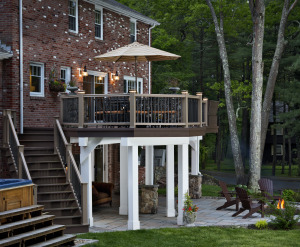 It can be used most of, if not all, year when the cold Massachusetts weather may keep the homeowners off the patio. 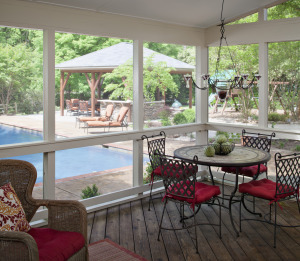 The sunroom is a great place to sit and relax or have a glass of wine with friends and family. The patio’s main use is dining. You can see that dining area is clearly defined by a circular paver pattern that’s different than the rest of the space. 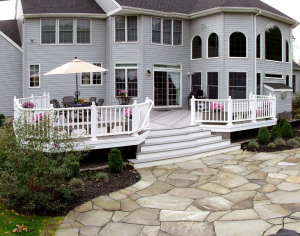 Changing the pattern of a building product, deck or patio, is an easy way to break up a space. 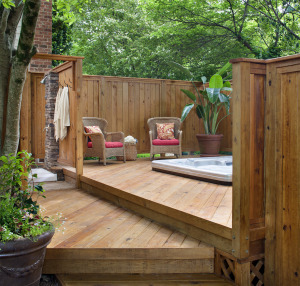 Lastly, a small raised deck was added as an entrance into the hot tub. The homeowners of this project wanted space to eat, entertain, enjoy and escape the sun. 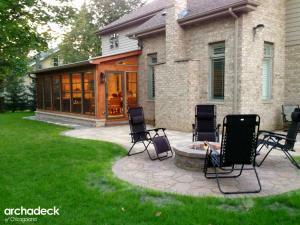 Our deck builder in Newton created a space that could encompass all those uses. The bottom patio level is made from brick pavers and is the perfect place to enjoy the sun whereas the screened porch is the best place to escape it. 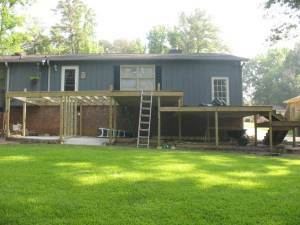 The deck is really two spaces with the pergola creating isn’t own space to the right. While this project is all one deck in Nova Scotia, its multi-level design break it up for its numerous purposes. On the top level, a custom outdoor kitchen, table and chairs define that space as the dining area, while the built-in bench and fire pit create a great place to sit and relax on a cool night. Talk about a multi-purpose space! 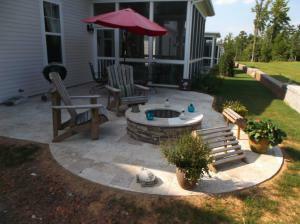 This project from our patio contractor in Macon has it all! 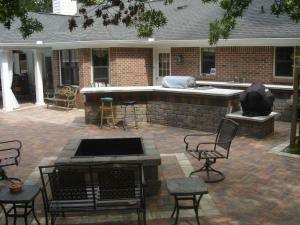 The custom outdoor kitchen has a large eat in bar to sit or stand at while cooking and the fire pit is clearly defined with a different colored paver. 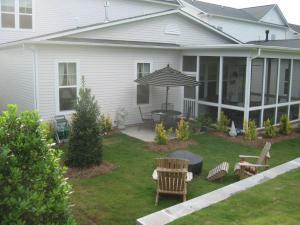 The large patio surrounds a pool where everyone can sit and relax. 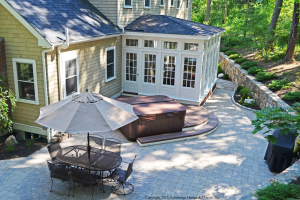 If you are interested in learning how a combination project can enhance your outdoor living space, contact your local Archadeck Outdoor Living office. My husband and I have a small deck off the back of our family room that offers a nice spot to sit outside with guests and grill out when the weather is nice. We’ve been thinking about updating the space since it’s pretty basic and is now showing its wear (it was there when my husband bought the house years ago). When talking about our options, we thought we’d be hampered by budget, but interestingly enough, our space is perfect for a low to grade patio, which is attractive and affordable. A low to grade patio is a patio that doesn’t have large level changes and is close to the ground. In my case, there is a less than five inch difference between the deck and the yard around it. Because leveling will be easier while building a low to grade patio, it can be an affordable option to updating your outdoor living space. Additionally, railings may not be required if the patio is low to the ground (make sure to ask your patio contractor about code specifications), saving you money on railings and posts. 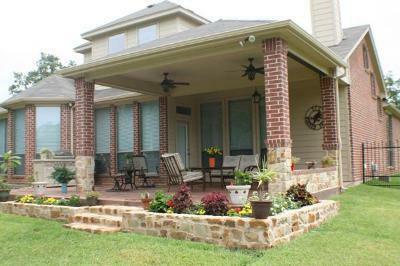 Low to grade patios are not only affordable in comparison to higher level patios, but are also extremely attractive. 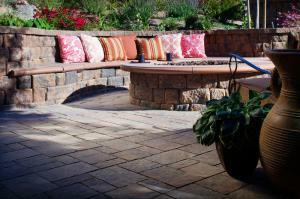 Paver patios come in a variety of colors, sizes and finishes. 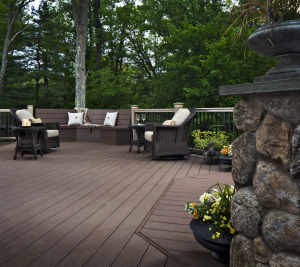 At Archadeck Outdoor Living, we show homeowners which options would look best with their home’s architecture and finish to make everything work together seamlessly. 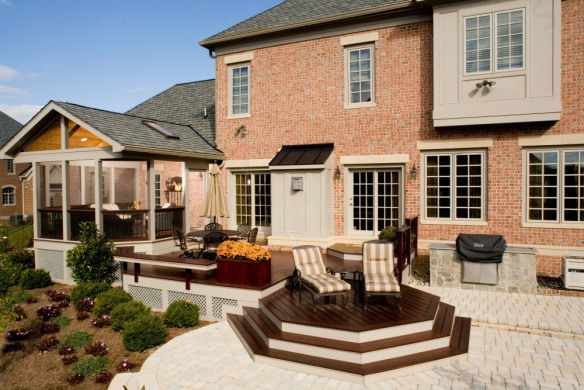 In previous posts, we have discussed the benefits of staged building, where you build different components of your outdoor living space at different times until you have the backyard that you’ve always wanted. 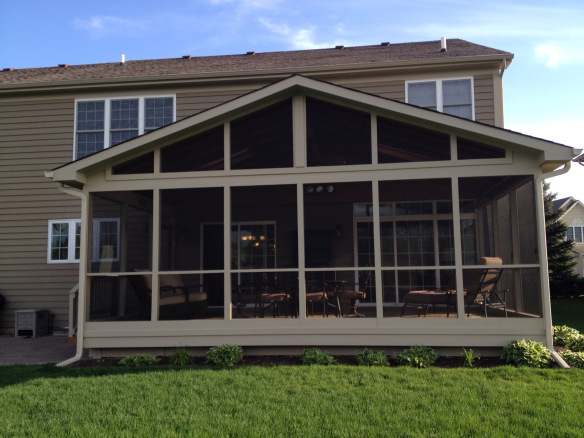 Low to grade patios are a great option to include in a multi-structure outdoor living space as they can be the perfect add-on to a deck, porch, sunroom or screened porch. 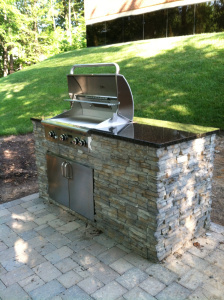 Furthermore, with all of the finishes available, you shouldn’t have a problem finding an outdoor kitchen or fire pit that complements it flawlessly if you want to add that later. If you would like to see how a low to grade patio (or deck) can be incorporated into your outdoor living space, feel free to contact your local Archadeck office. We at Archadeck love to see all of the custom designed projects that our franchisees create for their clients. Like we’ve mentioned before, whether it’s a patio, porch or deck, each of our outdoor living spaces is created with the customers’ tastes, budget and lifestyle in mind. Recently, Curtis Crays, the owner of Archadeck of Front Range, created the perfect paver patio for clients who had been saving for 10 years for the backyard of their dreams. 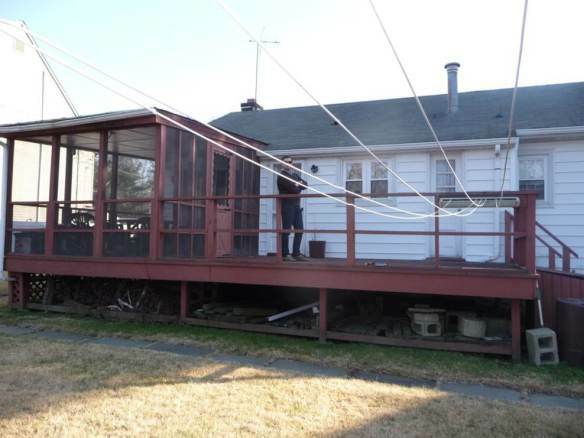 The before picture to the right shows the not-so-special outdoor living space they had before. There was a small area that was covered with rocks and a stone path going through it. There was nothing special or comfortable about the space that invited you to spend additional time outdoors overlooking the beautiful foothills of Golden, Colorado. The homeowners knew they wanted the perfect outdoor space and saved for years to make it happen. When Curtis initially visited the homeowners, they had a clear idea of what they wanted in the space: a large paver patio, stucco wall, an iron gate and some kind of fire feature. And boy did they get it. Look at these after pictures! Wow! 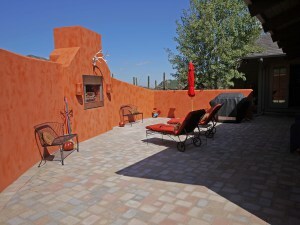 The patio, constructed with borgert pavers, includes neutral greys to provide an even base and sporadic red pavers that complement the vibrancy of the red stucco. And with 1,000 square feet of patio, the homeowners now have the perfect place to relax or entertain friends and family. It all begins with an image in the homeowner’s mind. 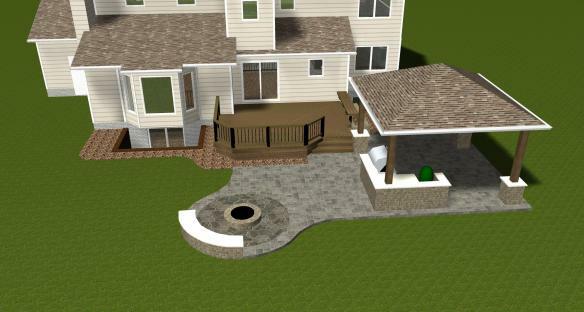 Excited homeowners who have decided to add to their back yard look to us for guidance and to design the outdoor structure they have been dreaming of. Every outdoor structure is different – as different as each of our customers that incorporates their individual style, and intended function into the design. 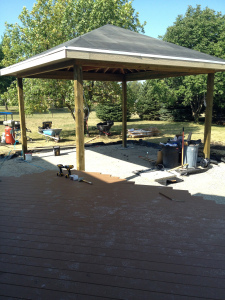 This week we take a glimpse into two very different patio designs by Archadeck of Chicagoland, and see the way the hardscapes can be designed to suit the individual owner’s needs. First we take a trip to Libertyville, IL where David Berryhill and his talented design staff were able to create an area that made the homeowner’s existing backyard more accessible and easier to view since this is where the children’s play set is located. 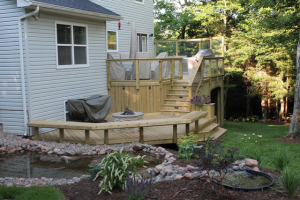 The homeowners were only initially looking to have Archadeck of Chicagoland build a deck and create more access to the rear of the yard. 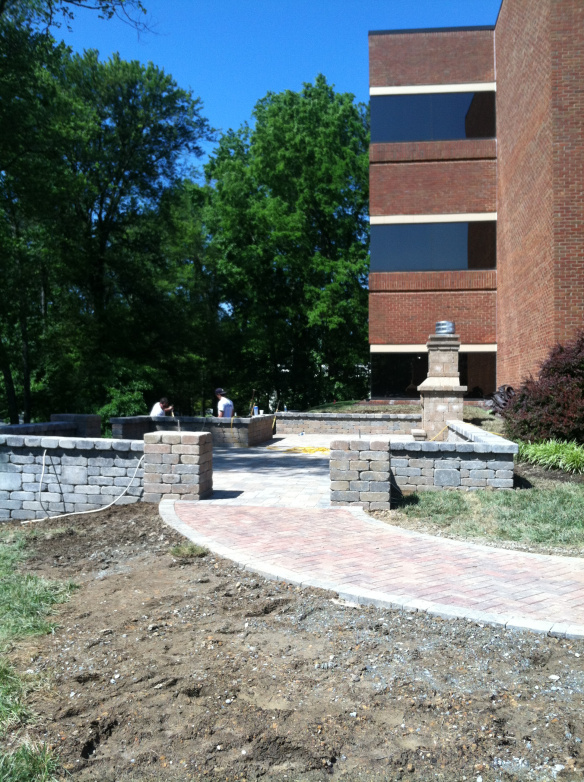 We were able to deliver a functional hardscape structure that met all of their needs. The patio is more conducive to the grade of their lot so they created a multi-level patio that followed the natural grade of the landscape and provided flow to their children’s play set area. The patio is constructed from a combination of Brussells block pavers by Unilock and Brussells block dimensional stone for the curvilinear walls. 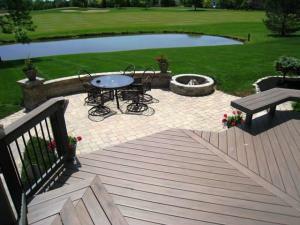 Our second spotlighted patio by Archadeck of Chicagoland is located in Wheeling, IL. The homeowner’s wish was for a patio, a fire pit and an area outdoors to dine and be able to grill. Their answer was to build a patio that had separate areas for dining, and a separate grill and cooking area, and of course a stunning custom fire pit complete with a custom hardscape seating wall built right into the curves of the patios grand design. 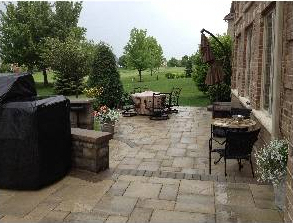 For this patio we used Cantebury pavers and Brussells dimensional stone . 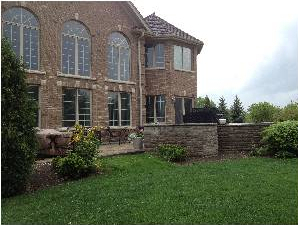 For more awe-inspiring patio and hardscapes visit our photo galleries on our website.